Evander Frank Kane (born August 2, 1991) is a Canadian professional ice hockey left winger for the San Jose Sharks of the National Hockey League (NHL). Kane was selected fourth overall in the first round of the 2009 NHL Entry Draft by the Atlanta Thrashers. During his major junior career, Kane won the Memorial Cup with the Vancouver Giants of the Western Hockey League (WHL) in 2007, finished as runner-up for the Jim Piggott Memorial Trophy as WHL rookie of the year in 2008 and was named to the WHL West First All-Star Team in 2009. Kane also set the Giants' franchise record for single-season goals in 2008–09. Internationally, Kane has won gold medals with Team Canada at the 2008 Ivan Hlinka Memorial Tournament and 2009 World Junior Championships. He has also competed in the 2010, 2011, 2012 and 2014 IIHF World Championships. Kane was born on August 2, 1991, in Vancouver, British Columbia, to Perry and Sheri Kane, who named him after American boxer Evander Holyfield (he later met Holyfield at age 18). Coming from an athletic lineage, his father was an amateur boxer and hockey player. Kane's mother was a college volleyball player. His uncle, Leonard Kane, is a member of the Canadian Ball Hockey Hall of Fame. Kane's cousin, Dwayne Provo, played in the Canadian Football League (CFL) for seven years and spent one season with the New England Patriots of the National Football League (NFL). Another cousin, Kirk Johnson, boxed for Canada at the 1992 Summer Olympics in Barcelona and later fought John Ruiz for the 2002 World Boxing Association (WBA) Heavyweight title. Growing up in East Vancouver, Kane attended high school at John Oliver Secondary. In addition to hockey, he played baseball, basketball, and soccer growing up. After beginning to skate at the age of three, he began playing minor ice hockey at eight. His father instructed him in his early years and initially wanted to keep him out of organized hockey until Kane was ten. Kane played in the 2003 and 2004 Quebec International Pee-Wee Hockey Tournaments with a team from North Vancouver. At the age of 14 years, Kane recorded 140 points in 66 games with the bantam North Shore Winter Club, followed by a 22-goal, 54-point campaign to finish fourth in league scoring with the Greater Vancouver Canadians of the BC Hockey Major Midget League (BCMML). Kane also played minor hockey with the Vancouver Thunderbirds, prior to bantam and midget. 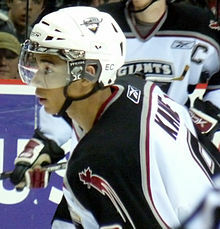 Kane was drafted 19th overall in the 2006 WHL Bantam Draft by the Vancouver Giants. He received his first WHL call-up for a game against the Seattle Thunderbirds on December 13, 2006, due to other Giants players international commitments in the World Junior Championships. Kane scored his first WHL goal, a game-tying marker, on March 25, 2007, the last game of the regular season. He also suited up for five WHL post-season games, being originally called up for the playoffs after Giants forward Tim Kraus was suspended for game three of the opening round. He later appeared in two Memorial Cup games, tallying an assist, as part of the Giants' 2007 Memorial Cup championship. Set to begin his rookie campaign with the Giants the following season, Kane experienced a minor setback, as he was forced to miss the start of training camp with a case of mononucleosis. He nevertheless recovered and joined the Giants full-time to tally 24 goals – third in team scoring – and 41 points in his first WHL season. Finishing tenth in rookie scoring, he was nominated for the Jim Piggott Memorial Trophy as WHL rookie of the year, which was awarded to Brayden Schenn of the Brandon Wheat Kings. Kane emerged with an impressive start to the 2008–09 season, registering at least a point in each of his first 22 games. After recording his first WHL hat-trick on October 10, 2008, against the Kelowna Rockets, he was named WHL Player of the Week on October 12, succeeding linemate Casey Pierro-Zabotel, who had been chosen the previous week. Kane earned a spot as an injury replacement at the 2009 World Junior Championships with Team Canada. Upon returning with a gold medal, Kane was named player of the week for the second time in the season on January 12, 2009, after scoring six points in two games immediately following the World Juniors. Later that month, he participated in the 2009 CHL Top Prospects Game as captain for Team Cherry. Kane finished his second WHL season with 48 goals and 96 points, fourth in League scoring. He surpassed Adam Courchaine's team record of 43 goals in a single season, set in 2002–03. Second in team scoring to Pierro-Zabotel's 115 points, the linemates finished one-two in all-time Giants' single-season scoring as Pierro-Zabotel and Kane both surpassed Gilbert Brulé's previous 87-point mark. Kane received WHL West First Team All-Star honours along with teammates Pierro-Zabotel and Jonathon Blum. In the subsequent 2009 playoffs, after the Giants swept the Prince George Cougars in the first round, Kane scored a double-overtime game-winner to force a seventh game in the second round against the Spokane Chiefs. After eliminating the Chiefs in the seventh game, the Giants were then defeated by the Kelowna Rockets in six games in the semi-finals. In 17 post-season games, Kane accumulated 15 points. Kane was selected fourth overall by the Atlanta Thrashers. 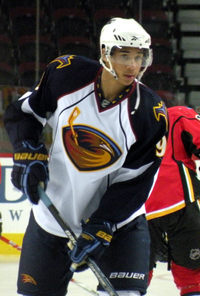 Less than a month later, the Thrashers signed Kane to an entry-level contract on July 20, 2009. Kane made the Thrashers' lineup out of his first NHL training camp for the 2009–10 season. He recorded his first career NHL point in his debut on October 3, 2009, earning an assist on a goal by Rich Peverley against the Tampa Bay Lightning. His first goal was scored five days later, on October 8, beating Chris Mason with a snap shot in a 4–2 win over the St. Louis Blues. He suffered a bone fracture, late in his rookie season, blocking a shot during a game against the Tampa Bay Lightning on March 6, 2010. Kane missed 15 games before returning to the lineup on April 3. Kane finished his NHL rookie campaign with 14 goals and 26 points in 66 games, ranked 12th among first-year point-scorers. Kane suffered several minor injuries during his second NHL season in 2010–11 season. During a game against the Colorado Avalanche on November 30, 2010, Kane suffered a left knee injury after he was struck by a shot from teammate Tobias Enström; he missed two games. The following month, he missed one game due to an arm injury, sustained during a game against the Pittsburgh Penguins on December 7. In January 2011, he missed an additional six games due to a lower-body injury. Kept from the lineup for a total nine games, Kane increased his points total to 43 with 19 goals and 24 assists. He ranked fifth in team point-scoring – third among forward behind captain Andrew Ladd and Bryan Little. During the off-season, the Thrashers franchise was bought and relocated by True North Sports and Entertainment, becoming the Winnipeg Jets. Kane was enjoying a successful first season as a Jet, leading his team in scoring with 18 goals and 31 points by mid-January 2012. During that month, however, he was sidelined with a concussion that was reported on January 21. Later in the season, he recorded a four-point game (two goals and two assists) in a 7–0 win against the Florida Panthers on March 1, 2012. On September 15, 2012, Kane signed a six-year, $31.5 million contract extension with the Jets. As a result of the 2012–13 NHL lockout, Kane joined Dinamo Minsk of the Kontinental Hockey League (KHL). He was the first Canadian NHL player to sign a contract with the KHL. However, after 12 games with the club, in which he recorded one goal, Kane was released. The club's athletic director suggested that Kane "could not adapt to hockey in the KHL," but also said that both sides mutually agreed to end the contract. On April 3, 2014, Kane was accused of assault, after an incident in Vancouver, and sued for financial damages. On April 5, 2014, Kane was a healthy scratch under new head coach Paul Maurice, in a game against the Toronto Maple Leafs. After the game, Maurice said it was a coach's decision, and that if Kane wanted back in the lineup, all he needed to do was "probably just come to the rink." On February 3, 2015 Kane was a healthy scratch against the Vancouver Canucks. It was later determined that he was scratched because of an incident with his teammates. Kane revealed in an October 2015 interview that he felt the Jets did not "have his back" throughout his legal and behavioral issues but instead felt that they traded away their problem. The Jets traded Kane on February 11, 2015, as well as Zach Bogosian and the rights to Jason Kasdorf, to the Buffalo Sabres in exchange for Tyler Myers, Drew Stafford, Joel Armia, Brendan Lemieux and a conditional first-round pick in the 2015 NHL Entry Draft (Jack Roslovic). On October 14, 2016, Kane cracked three ribs in the season-opening game when he crashed into boards while fighting for the puck with Alexei Emelin of the Montreal Canadiens, which left him unable to play indefinitely. Amid declining performance and approaching the end of his contract, Sabres management benched him ahead of the 2018 trade deadline. On February 26, 2018, the Sabres traded Kane to the San Jose Sharks in exchange for Danny O'Regan, a conditional first-round or second-round pick in 2019 and a conditional fourth-round pick in 2020. In his Sharks debut, Kane had two assists in a 5–2 win against the Edmonton Oilers. On March 16, 2018, Kane scored his first NHL hat-trick against the Calgary Flames, and then later added a fourth goal, contributing more than half the goals in the Sharks 7–4 win. On April 26, 2018, Kane received a one-game suspension for cross-checking Vegas Golden Knights forward Pierre-Edouard Bellemare during Game 1 of the Western Conference semi-finals. Through nine playoffs games, Kane recorded four goals and five points. On May 24, 2018, the Sharks re-signed Kane to a seven-year, $49 million contract worth $7 million annually. Kane has said that he would like to remain with the Sharks for the rest of his career. On August 1, 2016, Kane plead not guilty to charges alleging he grabbed three women during an altercation at a downtown Buffalo bar in June 2016. The charges against him were dismissed in October 2016. On March 14, 2019, Kane announced on Twitter that his wife had had a miscarriage at 26 weeks. Kane competed in the 2008 Ivan Hlinka Memorial Tournament, capturing gold with Canada's under-18 team. He totalled four points in four games, including an assist in the 6–3 gold medal game win against Russia. Later that year, Kane competed on Team Canada during the 2009 World Junior Ice Hockey Championships. As the youngest player on the team, Kane contributed six points in six games, helping Canada to a fifth-straight gold medal with a 5–1 victory over Sweden in the final. Following his rookie season in the NHL, Kane was named to the Canadian men's team for the 2010 IIHF World Championship in Germany. general manager Mark Messier made a specific effort to assemble a young team; as a result, Kane was one of five teenagers on the roster. He finished the tournament with two goals and two assists in seven games. Canada was eliminated in the quarterfinal by Russia and finished in seventh place. The following year, Kane returned to the national team for the 2011 IIHF World Championship in Slovakia. Kane recorded two assists over seven games as Canada suffered a second consecutive defeat in the quarterfinal to Russia. ^ a b "Evander Kane Draft Prospect Card". National Hockey League. Retrieved May 27, 2009. ^ Waldie, Paul (December 5, 2011). "Jets' Evander Kane bangs, buries his way into limelight". The Globe and Mail. Retrieved December 17, 2011. ^ "Perry Kane will be a proud father on Draft day". National Hockey League. June 16, 2009. Retrieved June 17, 2009. ^ "Leonard Kane". Canadian Ball Hockey Association. Retrieved April 11, 2010. ^ a b c Ben Wright (June 29, 2009). "Family the Foundation for Evander Kane". National Hockey League. Archived from the original on November 4, 2010. Retrieved March 30, 2010. ^ a b "Giants bank on Kane". Vancouver Sun. May 5, 2006. Retrieved November 16, 2008. ^ Tait, Ed (December 3, 2011). "Busting loose". Winnipeg Free Press. Retrieved December 17, 2011. ^ a b c Steve Ewen (December 13, 2006). "Hay impressed by 15-year-old winger". The Province. Archived from the original on April 26, 2012. Retrieved May 27, 2009. ^ "Major Midget League Statistics – 2006–07". BC Hockey Major Midget League. Retrieved May 27, 2009. ^ a b "Giants turn to callup to fill hole". Vancouver Sun. March 27, 2007. Retrieved May 27, 2009. ^ a b "Confident Kane continues to grow his name". National Hockey League. March 17, 2009. Retrieved March 23, 2009. ^ a b c "Vancouver Giant nominated for WHL rookie of the year". Vancouver Sun. March 20, 2008. Archived from the original on November 6, 2012. Retrieved December 31, 2008. ^ "Prospect Kane to miss Giants camp with mono". The Province. August 25, 2007. Retrieved May 27, 2009. ^ "2007–08 Regular Season – Vancouver Giants". Western Hockey League. Retrieved December 15, 2009. ^ "Giants find more ignition trouble at Tri-City's Toyota Center". The Province. November 30, 2008. Retrieved December 3, 2008. ^ a b "Giants' Evander Kane named Boston Pizza WHL Player of the Week". OurSports Central. October 13, 2008. Retrieved September 20, 2010. ^ a b "Sensational season continues for World Junior giant, Evander Kane". CTV BC. January 12, 2009. Retrieved January 12, 2009. ^ "Evander Kane chosen for Top Prospects Game". CTV BC. December 19, 2008. Retrieved December 20, 2008. ^ "Top Scorers: 2008–09 Regular Season, All Players". Western Hockey League. Archived from the original on March 9, 2008. Retrieved March 15, 2009. ^ a b "Giants Win 5–4 in OT over Blazers". OurSports Central. February 21, 2009. Retrieved November 4, 2010. ^ "WHL:Vancouver Giants defeat Medicine Hat in come-from-behind win". Vancouver Sun. January 28, 2009. Retrieved January 29, 2009. ^ a b "Six Giants Named to WHL All-Star Teams or Awards Finalists". OurSports Central. March 18, 2009. Retrieved March 18, 2009. ^ "Giants Earn Double OT Win – Force Game Seven". OurSports Central. April 13, 2009. Retrieved September 18, 2010. ^ "Thrashers sign first-rounder Kane to entry-level contract". TSN. July 20, 2009. Retrieved July 20, 2009. ^ Vivlamore, Chris (October 3, 2009). "Thrashers open season with victory". Atlanta Journal-Constitution. Retrieved October 3, 2009. ^ "Thrashers at Blues – 10/08/09". National Hockey League. October 8, 2009. ^ Vivlamore, Chris (March 8, 2010). "Thrashers lose Kane, Schubert to injuries". Atlanta Journal-Constitution. Retrieved March 11, 2010. ^ a b c d "Evander Kane". The Sports Network. Retrieved April 12, 2010. ^ "2009–10 Regular Season – Rookie – All Skaters – Summary – Total Points". National Hockey League. Retrieved April 12, 2010. ^ Vivlamore, Chris (December 3, 2010). "Thrashers' Evander Kane practices, but status is uncertain". Atlanta Journal-Constitution. Retrieved April 15, 2011. ^ Vivlamore, Chris (December 31, 2010). "Thrashers notebook: Evander Kane returns". Atlanta Journal-Constitution. Retrieved April 15, 2011. ^ "2010–2011 Regular Season Atlanta Thrashers Points Leaders". National Hockey League. Retrieved April 15, 2011. ^ Hennessy, Kristi (March 1, 2012). "Jets pounce Panthers, 7–0". Winnipeg Jets. Retrieved March 5, 2012. ^ Canadian Press (September 16, 2012). "Jets sign forward Kane to six-year, $31.5 million deal". TSN.ca. Retrieved September 29, 2012. ^ Canadian Press (September 28, 2012). "Jets' Evander Kane signs with KHL's Dinamo Minsk". CBC.ca. Retrieved September 29, 2012. ^ Canadian Press (November 16, 2012). "Evander Kane done at Dinamo Minsk". Globe and Mail. Retrieved January 6, 2013. ^ McIntyre, Mike (April 3, 2014). "Jets star Evander Kane slapped with B.C. suit". Winnipeg Free Press. ^ a b Peaslee, Evan (February 11, 2015). "A timeline of Evander Kane 'episodes' with Jets". SportsNet. ^ Kane says Jets "Didn't Have My Back"
^ "Kane, Bogosian dealt to Sabres in eight-player blockbuster deal". TSN. February 11, 2015. Retrieved February 11, 2015. ^ LaBarber, Jourdon (October 14, 2016). "Kane out "weeks" with cracked ribs". NHL.com. Retrieved October 17, 2016. ^ "Sharks Acquire Evander Kane from Sabres". NHL.com. February 26, 2018. Retrieved February 26, 2018. ^ "Kane gets two assists in Sharks debut, helps defeat Oilers". NHL.com. February 28, 2018. Retrieved March 1, 2018. ^ "Sharks' Evander Kane scores 4 goals to push Flames further from playoffs". cbc.ca. March 17, 2018. Retrieved March 17, 2018. ^ "Cross-check earns Sharks' Evander Kane 1-game suspension". ESPN.com. April 27, 2018. Retrieved April 28, 2018. ^ Associated Press. "Sharks re-sign forward Evander Kane to seven-year deal". Sportsnet.ca. Retrieved May 29, 2018. ^ "San Jose | By Evander Kane". The Players' Tribune. Retrieved September 1, 2018. ^ "Sabres' Kane pleads not guilty to charges in N.Y. bar incident". cbc.ca. August 2, 2016. ^ Clinton, Jared (October 28, 2016). "REPORT: HARASSMENT CASE AGAINST EVANDER KANE TO BE DISMISSED". thehockeynews.com. Retrieved March 17, 2018. ^ a b "Kane added to Canadian world junior roster". Canadian Broadcasting Corporation. December 21, 2008. Retrieved December 7, 2009. ^ "2008 Under-18 Statistics". Hockey Canada. Retrieved December 22, 2008. ^ "First period outburst helps Canada claim under-18 gold". Hockey Canada. Retrieved December 22, 2008. ^ "2009 IIHF World Junior Championship – Canada Roster". Hockey Canada. Retrieved January 11, 2009. ^ "Young core leads Canada into hockey worlds". Canadian Broadcasting Corporation. May 5, 2010. Retrieved May 14, 2010. ^ "Canada's young guns deliver in hockey opener". Canadian Broadcasting Corporation. May 9, 2010. Retrieved May 14, 2010. ^ "Young Canadian team has bitter time". Canadian Broadcasting Corporation. May 20, 2010. Retrieved May 22, 2010. ^ "Kane, Clutterbuck commit to joining Canada at worlds". The Sports Network. Canadian Press. April 12, 2011. Retrieved April 15, 2011. Wikimedia Commons has media related to Evander Kane.